A 1967 news article from St. Louis said Earl Brown was working south of Delmar on Broadway. That would be Bert Grimm’s old shop at #716 North Broadway. Brown has an interesting story about how he got into the tattoo business. “My sister was going out with a tattoo artist and I got to hanging around the shop. One day I was left to watch the shop and a customer came in. I thought I’d tattoo him; it was a big knife design. Turned out to be a real big knife, I got it all over him. No, he was not pleased. The artist had to come back and finish him off. After that they said, if you want to learn, well teach you.” The article did not mention who that artist was or what year this occurred but many believe it was Bert Grimm who taught Earl Brown to tattoo. 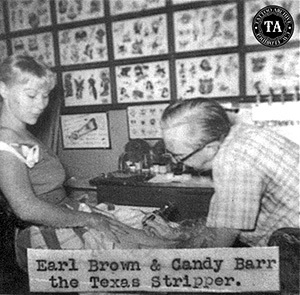 Earl Brown tattooed in many locations during his career. At #404 East Ninth Street in Hopkinsville, Kentucky, he billed himself as a master tattooist with 35 years' experience. His card stated, "I originate what others imitate." In the 1950s in Biloxi, Mississippi Brown worked with Bob Shaw at #323 Croesus Street. It is unknown when Earl Brown was born but when he died in 1983 he was an old man, so he must have been born around the turn of the 20th century. We would like to thank Carmen Nyssen for her help with this update.